Lafferty, Renee. "The Burning of Washington". The Canadian Encyclopedia, 06 June 2018, Historica Canada. 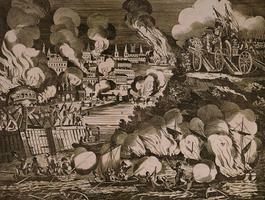 https://www.thecanadianencyclopedia.ca/en/article/the-burning-of-washington. Accessed 21 April 2019. In the final summer of the War of 1812, British presence in the Chesapeake region was strengthened in an effort to divert the American forces from the frontiers of Upper and Lower Canada. In the final summer of the War of 1812, British presence in the Chesapeake region was strengthened in an effort to divert the American forces from the frontiers of Upper and Lower Canada. Frustrated by the growing damages wrought by invading US troops, Sir George Prevost had instructed General Robert Ross, Admiral Alexander Cochrane, and Admiral George Cockburn to retaliate and "deter the enemy from repetition of similar outrages." In late August of 1814, that retaliation took shape with the capture and burning of Washington. Despite Britain's strong naval presence in the region, very little was done to protect Washington. The American secretary of war, John Armstrong, was convinced that Baltimore was the target. Concerned about the growing expense of the war, he hesitated to call out the militia, and he remained adamant that bayonets were stronger deterrents than barricades. Defensive weakness was exacerbated by President James Madison, who appointed General William Winder to safeguard the region. A man of indifferent skill and meagre experience, Winder was a political ally of the president, and the nephew of Maryland's federalist governor. With only 500 regulars at his disposal, Winder's untested abilities were quickly overwhelmed. The American position was weakened further by secretary of state James Monroe, who ordered an unauthorized redeployment of militia just prior to battle. Knowing that their enemy was unprepared, the British sailed up the Patuxent River and landed approximately 4500 men near Benedict, Maryland, on 18 August. Their march toward the capital went virtually unimpeded; the worst hazards they faced were the heat and humidity. On the afternoon of 24 August, they reached the eastern shores of the Potomac River at Bladensburg. There, they faced three lines of hastily arranged and poorly distributed American regulars, militia, sailors and marines, approximately 7000 men in all, described as little more than a motley rabble. With surprising ease, but not without substantial losses (casualties were estimated at 250), the British moved through the American defences to take the city. With few notable exceptions, the American troops - along with Madison and his administration - fled. The Americans' quick retreat later earned the nickname the "Bladensburg races." Once in control, the British troops proceeded to plunder what was left of the city. With foresight and determination, the president's wife, Dolly Madison, had managed to save many of the cabinet records and White House treasures. Nevertheless, the extent of the damages was extreme. While most private residences were left alone, the White House, the Capitol building (including the Library of Congress), the treasury building, and the navy yard were all in flames before the British left the following day. The burning of Washington became a key part of the proposal to move the US capital to the northern states, where it could be better defended; the proposal was only thinly defeated. When Madison returned, he faced heavy criticism for the sacking, as did John Armstrong, who was accused of deliberately sacrificing the city. Armstrong resigned shortly thereafter, and James Monroe was appointed the US secretary of war. The ruin left behind by the British drew sharp criticism not only from the Americans, but from politicians in England and Europe. Nevertheless, the majority of Britons saw the burning of the American capital as just retaliation for the burning of York and Niagara, and it remains, however awkwardly, a point of Canadian national pride. War of 1812A detailed interactive timeline of the War of 1812 from Historica Canada. Everything You Know About The Burning Of Washington Could Be WrongAn essay that provides an American perspective on the destruction of government buildings in Washington by British forces on August 24, 1814. From talkingpointsmemo.com.